K-Seal Expert Advice How Does Cold Weather Affect My Car’s Radiator? How Does Cold Weather Affect My Car’s Radiator? Cold weather can play havoc with car engines – and especially your car’s radiator. Learn how to combat the cold and prevent radiator leaks with K-Seal. Apart from forcing us to wrap up in scarves and coats when we leave the house, cold weather can play havoc with cars — especially when the temperatures regularly dip below freezing. Along with tricky road and tyre conditions, cold weather can cause some big problems for your car’s radiator in particular, as the cold will cause your radiator to contract and put strain on your hoses and hose clamps — making it much more likely a coolant leak could occur. A broken down radiator will make it nigh on impossible to warm up your car, and could quickly cause damage to your engine. Why does my car leak coolant when it’s cold? The cooling system is the part most significantly affected by cold weather. As your radiator has a lot of coolant circulating through it, the obvious effect of freezing temperatures is the partial or complete freezing of your coolant. This is because coolant is not the same as antifreeze, which works to lower the freezing point of the circulating liquid. This can affect the radiator and cooling system, which have to expand to accommodate the frozen liquid. Cracks may form because of the additional stress the system is under, and result in a leaking cooling system that could eventually cause the car to completely break down. The cold will also likely be causing your metal radiator to contract, making it much more likely your hoses and hose clamps come loose if they’re not tight enough. 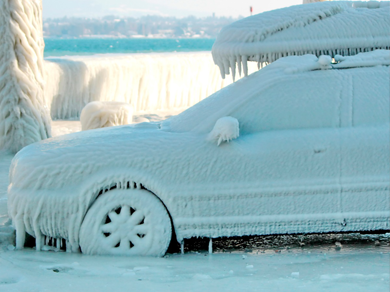 This is why you may find your car radiator only leaks when it’s cold. Additionally, any leak sprung in the radiator could mean that transmission fluid and coolant become mixed – while the former won’t harm the cooling system, the latter can harm the transmission. If this occurs, the transmission and radiator might have to be completely replaced. To catch this early and avoid a hefty repair cost, we recommend getting hold of some K-Seal from your nearest stockist to fix the leak, fast. Why can’t I heat up the temperature in my car? If the radiator breaks down as a result of frozen coolant, this could have a knock-on effect with regard to the car’s interior heating, which would make it difficult to defrost the windshield and stay warm while driving around. Cabin temperature wouldn’t be a significant issue in the summer, but it might be a major hindrance in the winter. The best way to prevent cold weather having an adverse effect on the cooling system and radiator is to properly maintain the car before the temperatures begin to drop. It’s important to ensure that your coolant levels are topped up so that there is enough to keep it circulating without freezing. How else can I look after my radiator in cold weather? You may also want to change your oil consistency to ensure maximum engine effectiveness – thinner oil viscosity is more suited to cold temperatures. If you are caught unawares, you may have to flush the system and refill it with the proper levels of oil and coolant, mixing in K-Seal sealant solution to fill the cracks that might have formed already. It doesn’t matter whether the engine is hot or cold when it is added – just shake, pour, and go! Is Your Car Radiator Experiencing Problems? Our guide provides invaluable guidance on car radiator repairs and maintenance.